This series is Worship Leader Magazine's 2012 Editor's Pick. For followers of Jesus Christ, worship has spanned over two thousand years to include a long and diverse history of sacred practices. The many ways in which the faithful have preserved and celebrated God’s story is limited only by the human imagination. 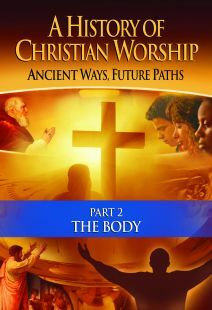 A History of Christian Worship: Ancient Ways, Future Paths is a six-part series that explores centuries of worship practices, as seen through the eyes of Protestant, Catholic and Orthodox churches and discussed by leading voices from a cross-section of the Christian community. 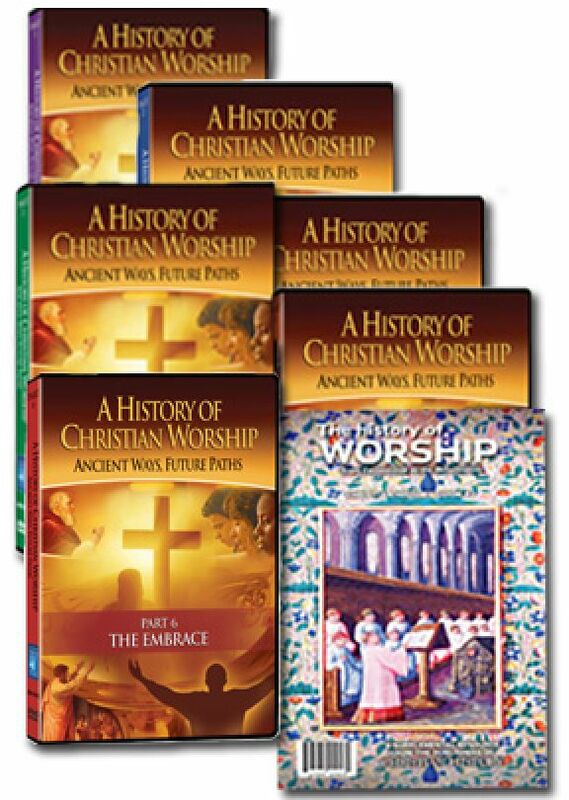 From scripture, sermons and creeds to baptism and the Eucharist, from art and music to drama and media, from prayer and contemplation to service and ministry, viewers will discover the significant people and events that have shaped history and learn how modern worship practices are rooted in the earliest foundations of the Christian faith. • What early church documents reveal about ancient worship practices and why many churches are recovering and continuing these ancient faith practices today. • How stained glass has been used to tell the stories of scripture, including a visit to the oldest continually operating stained glass studio in America. • Why influences such as the printing press and the translation of the Bible into the language of the people dramatically changed how scripture is used in worship. • How great preaching movements of the church have influenced the development of sermons and homilies. • Why creeds such as the Apostles’ and Nicene Creeds are an important tool for teaching the essentials of the Christian faith. ﻿• What early church documents and practices teach us about how baptism is celebrated today. • What symbols are common to all Christians in the celebration of baptism. • Why there are different forms of baptism among various Christian traditions. • How the Scriptures and church history support the community of believers as an important part of worship. • How one unique community of believers celebrates worship through its western-themed cowboy church. • What early church documents and practices teach us about how the Eucharist is celebrated today. • Why the feast of the table is called by different names: Eucharist, Communion, the Lord's Supper. • What the different methods of celebrating the Eucharist are among various Christian traditions. • How Old Testament feast days and festivals have formed a pattern for the current Christian calendar of holy days and seasons. • Why the liturgical year is still relevant for Christians today. ﻿• How paintings, sculptures, stained glass and icons visually convey God's story. • Why worship space and architecture influence and enhance the worship experience. • What types of media have been used at various times in Christian worship. • How the the digital age and the advent of advanced technology have impacted worship. • How beloved prayers such as the Lord's Prayer have become an essential part of our ongoing dialogue with God. • Why public and private prayer is essential to Christian worship. • How the Church throughout the centuries has carried its message to the world through missions and caring for the poor, imprisoned, sick, and dying. • How a ministry called Broken Chains reaches out to the biker subculture with the Gospel message. Includes optional English subtitles and film trailers. For these topics and more, join us on a journey from ancient ways to future paths as we discover a history of Christian worship. This 6-part series traces various aspects of worship from their use and development in ancient times to their continuing development in modern Christian worship. Rather than beginning with ancient worship and tracing the development of worship as a whole over the years, each DVD begins with an aspect of worship and shows how its use in modern times is congruent or different than its use throughout church history. By interviewing scholars, theologians, and worship historians, this DVD series offers a wide and ecumenical history of worship. The six DVDs focus on: The Word, The Body, The Feast, The Music, The Expression, and The Embrace. Each DVD contains two 28-30 minute sections, which could either be watched separately or as a whole unit. Part 1: The Word - The first section on this DVD, "Scripture in Worship," looks at the many ways Scripture has been used in worship through our different senses. This explores the many ways Christians throughout the centuries have "Heard the Word, seen the Word, prayed the Word, sang the Word, read the Word, and done the Word." The role of stained glass as an educational and devotional tool, particularly among the illiterate, is addressed by interviewing two modern stained glass artists. There is also an exploration of how the Bible became available for more people to read on their own through the development of the printing press and its translation into other languages. The sung Word is explored through Calvin's work to revive congregational singing of the Psalms. The second section, "Creeds and Sermons," looks at the development of the ways in which the Word is heard in worship. Beginning with Peter's first sermon on the day of Pentecost, and following the various preaching revivals in the Middle Ages, and the Great Awakening in the 1800s, this section examines how preaching has been and continues to be a tool for proclaiming the Word of God in worship. The development of the creeds, particularly the Apostles' Creed and the Nicene Creed, are explored along with their current use in worship. Part 2: The Body - The first section, "Baptism in Worship," traces baptism as a sacrament of the church from Jesus' instructions in the Great Commission to the three current modes of baptism which are practiced today. A brief look at the origins of baptism as a Jewish purification process to the baptism that John the Baptist offered are also illuminated to understand the differences between these practices and modern understandings of the sacrament. Immersion, pouring, and sprinkling are all equally addressed as acceptable modes of baptism in different traditions. Biblical and theological foundations are given for each mode. There is also an exploration of infant baptism and the theological understandings that lead some denominations to embrace it while others reject it. "Community in Worship," the second section on this DVD, traces the beginning of Christian community from its roots in the early church. Using the Book of Acts as a starting point, the importance of gathering together as a worshiping body is shown as a foundation for Christian life. Also highlighted are some of the splits the Christian community has suffered, including the split between the Eastern (Orthodox) and Western (Roman Catholic) Churches. However, even as these splits are explored, the great commonality of beliefs is celebrated as a way all Christians can continue to see each other as belonging to the Body of Christ. Part 3: The Feast - "Eucharist in Worship," the first section on this DVD, explores the biblical origins of the Eucharist. It also explores the origins of the three main designations for this sacrament: Lord's Supper, Communion, and Eucharist. From the meals Jesus shared with his disciples to our current and varied expressions of the Eucharist in worship, this section explores some of the different theologies that surround our modern understanding of this shared meal. The prayers that occur as part of the celebration of this sacrament and their bridging of Old Testament and New Testament understandings of the work of God are also explored for their theology and role in communal worship. The second section, "Holy Days in Worship," looks at the liturgical calendar. The cycle of seasons, from Advent to Lent to Easter, are used as a context for walking the life of faith throughout the whole year. An exploration of the history and role of saint's days in the Roman Catholic Church offers an interesting way of celebrating the lives of Christians throughout the centuries. This section also explores the reforms of the saint's day celebrations that were implemented by the Vatican II council. Part 4: The Music - The first section on this DVD, "Hymns and Songs in Worship," explores the variety of ways music enhances worship. From the use of psalms in Jewish worship and progressing to the early Christian hymns, music has always been a part of lifting our voices in praise and worship to God. The early church did not use instruments in worship and this tradition continues in Eastern Orthodox and Anabaptist traditions. Plainsong and chant became popular during the Middle Ages as forms of sung worship. The development of the organ and its use in worship firmly established the use of instruments in many Christian worship traditions. This section also contains a brief exploration of the "Worship Wars" between traditional and contemporary worship formats. Section 2, "Liturgy and Structure," explores the role of liturgy in Christian worship. Liturgy translates as "the work of the people." The Western Church's liturgy holds its roots in the development of the Roman Catholic Mass. Both liturgical worship and "free church" worship follow patterns in their praise of God. This section explores the patterns of worship which have similarities and differences across traditions. Part 5: The Expression - The first section of this DVD, "Visual Arts in Worship," explores how the arts and architecture have an impact upon Christian worship. Beginning with a contrast between the ornate worship space of a Roman Catholic cathedral and a stark Quaker meetinghouse, architecture has an effect upon the worship that takes place in those locations. The earliest churches were homes. However, when Constantine legalized Christianity in 321 CE, church worship moved into separate buildings built specifically for worship. The exploration of church architecture also follows some of the changes the Reformers made to the liturgical furniture. The Reformers changed the altar to a communion table and ensured the place of the pulpit in a centralized location. Iconography and the development of Christian symbols such as the crucifix have also served as entry points for Christians to connect with God. The second section, "Drama and Media," traces the movement of drama in worship from its beginning in Jesus' teaching in parables to the passion plays made popular in the Middle Ages to the multimedia presentations of the gospel in our present time. The access to the Bible itself was radically changed with the development of the printing press, the translation of the Bible into the vernacular, and the increase in literacy rates. Scripture could then be read to oneself as part of a private devotion time. This section also contains a brief exploration on the use of multimedia in worship and its impacts and possible shortcomings. Part 6: The Embrace - The first section, "Prayer and Contemplation in Worship," follows the development of prayer beginning with the early church's practice of daily prayer gatherings. The three parts of Christian daily prayer: 1. Reading the Psalms, 2. Reading and exploring the Word, and 3. Prayer, finds its origin in the Jewish tradition of prayer. One of the scholars interviewed in this section discussed how prayer "prepared us to receive what God wants to give us." The monastic movement is also explored with its tradition of keeping the Divine Hours—a cycle of prayers at appointed times throughout the day and night. "Service and Ministry in Worship" seeks to transition what goes on within the four walls of an appointed worship space with what goes on in the world and in the life of the believers throughout the week. From the words of benediction that send worshipers out into the world to spread God's Word, worship is a preparation for life as faithful followers of Christ outside the church walls. This section includes a discussion of how acts of service grow from worship of God. The History of Christian Worship is a wellpresented series exploring 2000 years' worth of traditions across church history. Baptism creeds prayer art music sermons and much more. Experts are interviewed to explore the important history much of it common to all denominations and then modern believers share how they are engaged in meaningful worship. I particularly enjoyed learning about the Cowboy church and the stained glass artists' interpretation of Scripture. This program enhances my worship as I now have more of a link to those who have worshiped the same Lord yet in different places times and denominations of history. A well written and produced DVD that is not bias toward one religious view of Christian history. I found the material to be informative current and engaging. I am confident the series will equal or exceed my expectations based on my response to Part 1. The work you’re doing on “A History of Christian Worship: Ancient Ways, Future Paths” has been wonderful, and I’m thoroughly enjoying parts 1, 2, and 3. This is a resource the body of Christ has needed for some time — thank you for bringing your vision and expertise to the task!